Disclosure: I received this product as an advertorial. I like most people I know, have embarked on this weight loss journey. I must admit, the older I get the harder it gets. The one thing that I have found is having a really good scale can make all the difference in the world. I have had a lot of experience with scales that don’t provide accurate readings which is frustrating to say the least. I recently found out about a highly sophisticated scale that I didn’t even know existed that not only provides accurate reading but also makes weighing yourself fun. The scale is called The Weight Gurus Smartphone Connected Digital Bathroom Scale. In case you are not familiar, here is a little information on it. 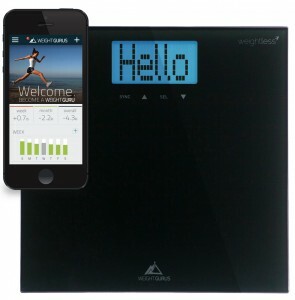 The Weight Gurus Smartphone Connected Digital Bathroom Scale was specifically designed to encourage weight loss. The Free Weight Gurus smartphone App (iOS and Android) tracks progress and chart progress to help you reach your goal (smartphone not required for scale use). Weightless technology lets you manage your weight by how much you’ve lost instead of how much you weigh. With Weightless, you decide how to view your weight: by the number or weightlessly by weight change. This scale includes easy-to-read extra-large, extra-bright backlit display. I totally get a kick out of being able to use my smartphone to chart my progress on the go! To find out more about The Weight Gurus Smartphone Connected Digital Bathroom Scale. Head over to Amazon.